"Thank you for visiting ths home page." 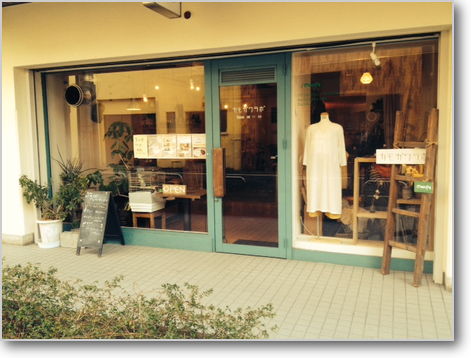 "Kamogawalabo" is a collaboration shop of a restaurant of curry & cafe, and a handmade clothes shop, "MONPE". Please, spend your lunch hours while relaxing, having spicy curry, cake, chai and/or coffee, and watching handmade clothes until 16:00. In Kamogawalabo, there is space for a small your classroom (English, picture letter, a small number of lessons, etc.). The maximum capacity is for 30 people. Patty and various meetings are available. We have Wi-fi station what you can use without fee. Please contact us. The history of Kamogawalabo is from to the "Pakistan curry shops", what Mieko Horiike began in 1987. Miek’s climbing patrimony, Ms.Tadako Tokunaga , an woman of Pakistan resident, has devised a recipe of "Pakistan curry" to suit her own tongue by using the ingredients of Pakistan. 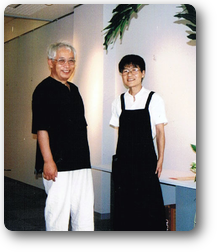 Mieko Horiike and Masao Horiike, one of her climbers fellow of the time, loved the taste of the "Pakistan curry" of Tadako Tokunaga. 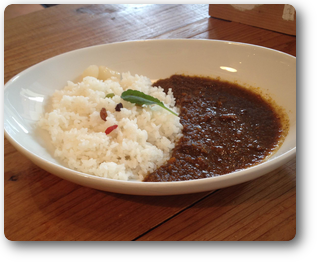 According Tadako's recipe of Japanese Pakistan Curry, Mieko Horiike opend a small "Pakistan Curry Shop", which had just 8 seats in the place of the Kyoto Kamigyo-ku, where we have a curry restaurant now. This shop was so popular, how several customers make a line to eat. After three years, she could expand its flower after the specialty store "Big Horiike" of mountain and ski gear, facing the Marutamachi street. Since she employed a serving of Indonesian, it had the exotic atmosphere. Although this shop was open until 2004, with the death of her husband, Masao Horiike, she closed Pakistan curry restaurant. In 2009, Mieko Horiike is also passed away, however, her recipe was taked ober by "Candy La Fall" located near Prefectural Office, and by "Karvii" located Koujinguch. However, both restaurants now closed from some reaasons. In 2013, Mieko’s daughter, Azumi Kinjyou, had been lived in Okinawa, came back to Kyoto after missing of Mieko, and began a Pakistan Curry restaurant as "Kamogawalabo" at the same location where had been Mieko’s Pakistan curry shop with only "8 seats" . 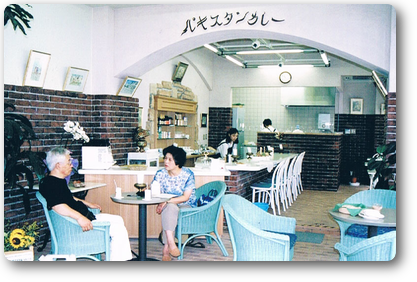 Some customers have nostalgic feeling, because of the place and the taste. Copyright © 2019 岩城倫弘 All Rights Reserved.